The mission of the Babylon IDA (Industrial Development Agency) is to facilitate cooperation between the private sector and the local government to promote new business development. Working at the intersection between business and government, the scope of the Babylon IDA is wide-ranging - from individual businesses, to major construction and everything in between. 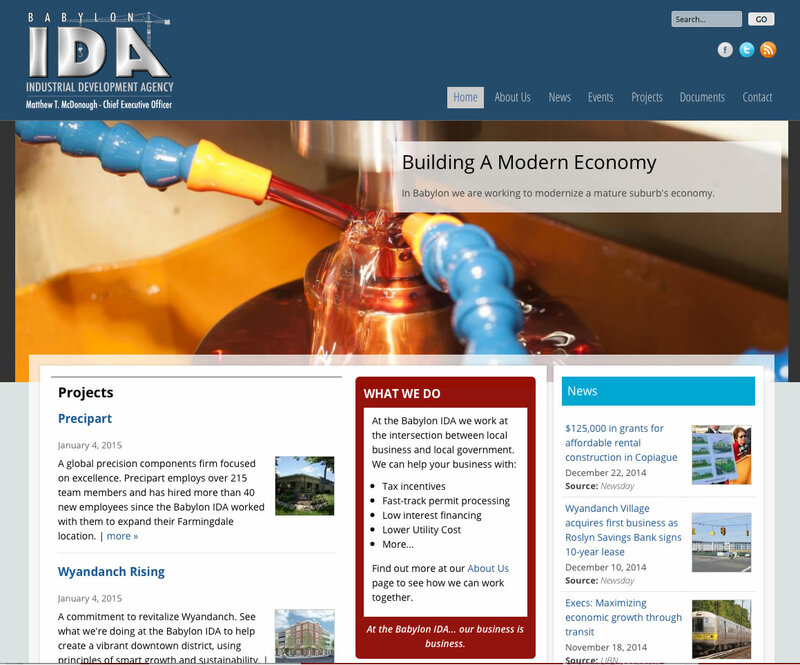 As a quasi-governmental agency, the Babylon IDA has stringent reporting and disclosure requirements; one challenge was to design an interface for public documents which was both easy to use for site administrators and easy to navigate for site visitors. InterCreative Media came up with a solution that accomplished both. The Documents page uses collapsible blocks to categorize public documents going back years in a system that's both easy to update for the organization, and easy to use for site visitors. Smartly designed (and fully adaptive to display on devices from mobile to tablet to desktop), the new site fulfills the Babylon IDA's mission of transparency, while reflecting their commitment to the future of the Town of Babylon.